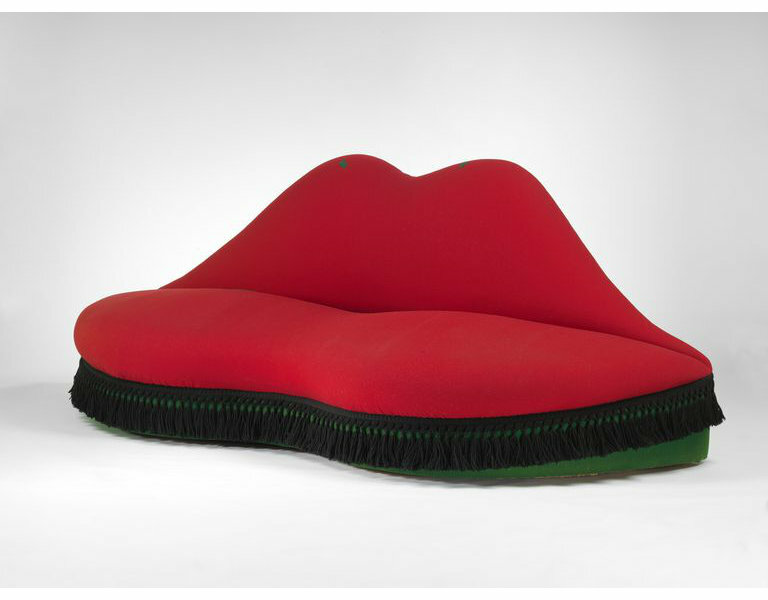 The Mae West Lips sofa (as it has become known) is one of the most recognisable examples of modern furniture in the world. The making of a sofa was the idea of Surrealist patron, collector, collaborator and poet Edward James, one of the most important figures in the history of Surrealism. It was James who suggested to his good friend Salvador Dalí that a three-dimensional sofa be made based on the latter’s gouache ‘Mae West’s Face which may be used as a surrealist apartment’ (1934/5, Art Institute of Chicago). James commissioned and supervised the construction of five versions of the sofa, all made in 1938. The current sofa, one of a pair, was made specifically for Monkton House (1902, architect Edwin Lutyens), a small house on Edward James's family's West Dean estate in West Sussex. James moved into Monkton in the mid-1930s and lived there until he moved to Mexico in the late 1940s, returning from time to time in later years. The detailing of the sofa with upholstery in red with a green base, black fringing and green, larvae-shaped appliques, was designed as seating by the fireplace in the dining room, one of the remarkable Monkton House interiors. The interior and exterior refurbishing of Monkton House was conceived by James from 1935, working with architect Christopher ‘Kit’ Nicholson (assisted by Hugh Casson) and decorator Norris Wakefield. It included other examples of Surrealist furniture, specially woven carpets and textiles (including black-fringed pelmets in the dining room) and outlandish decoration in an attempt to create what Stephen Calloway has described as ‘a complete Surrealist house’. It was the only such house in Britain. While other similar (but plainer) Mae West Lips sofas were made in 1938 for James, this (and its pair) were the only ones made for Monkton, or for any James interior scheme. Although the existence of fringing on the current example clearly makes it seem, in retrospect, a less pure version of the design, this sofa relates much more closely than others to James’s idea of the complete Surrealist interior and very much to a British mid-20th-century taste that managed to artfully combine Victorian, Edwardian and Surrealist elements. The most exhibited version of the sofa—without fringing or any added decoration—is entirely in 'shocking' pink, which James described as ‘too flashy’. 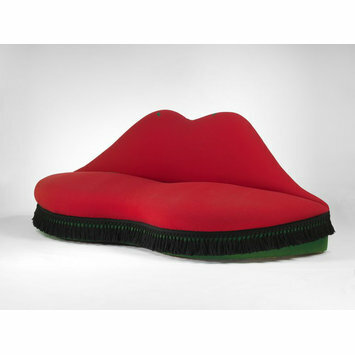 A sofa in red felted wool in the shape of lips, with a black wool fringe around its base. Decorated with green felted appliques in the form of larvae. Chris Smith, 'A Mouth-Watering Acquisition', the Art Quarterly, Autumn 2018, p. 88.